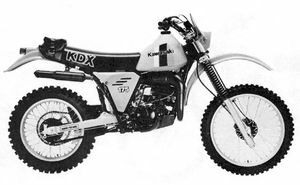 The Kawasaki KDX175A is a motorcycle produced by Kawasaki from 1980 to 1982. 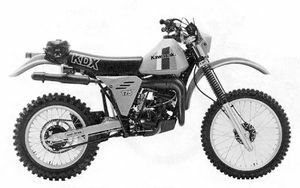 The Kawasaki KDX175 was an enduro motorcycle manufactured by Kawasaki from 1980 through 1981 and based upon the the Kawasaki KS125. It had a leading axle front fork, uni-track rear suspension, box section swing arm, basic lighting equipment, CDI ignition system. Major Changes: Adjustable front fork, tire pattern, chaincase. This page was last edited on 26 August 2010, at 18:08.